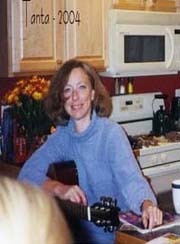 Based on preliminary reports from the State Highway Agencies, travel during June 2011 on all roads and streets in the nation changed by -1.4 percent (-3.8 billion vehicle miles) resulting in estimated travel for the month at 259.1** billion vehicle-miles. Cumulative Travel changed by -1.1 percent (-15.5 billion vehicle miles). This was before the recent slowdown. 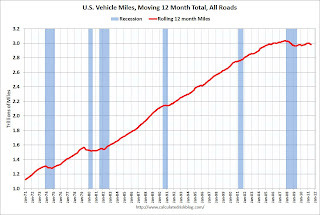 This graph shows the rolling 12 month total vehicle miles driven. 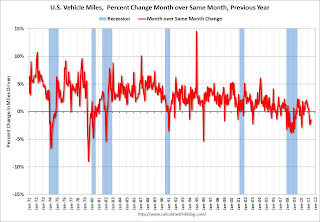 In the early '80s, miles driven (rolling 12 months) stayed below the previous peak for 39 months. Currently miles driven has been below the previous peak for 43 months - so this is a new record for longest period below the previous peak - and still counting! Note: some people have asked about miles driven on a per capita basis (or per registered driver), and I'm still looking at the data. The second graph shows the year-over-year change from the same month in the previous year. So far the current decline is not as a severe as in 2008. With the slowdown at the end of July and in August, miles driven might decline further.